If there is one painting that gives an intense depiction of the sweltering heat, the arid land, the crooked, twisting trunks and branches and the atmosphere of an olive grove in Provence, it is this work by Vincent van Gogh. From May 1889 Van Gogh stays in the asylum at Saint-Rémy. When he feels well enough and has permission to paint outside the grounds, he often visits the olive groves in the area. ‘There are very beautiful fields of olive trees here, which are grey and silvery in leaf like pollard willows. Then I never tire of the blue sky’, he writes to his mother. 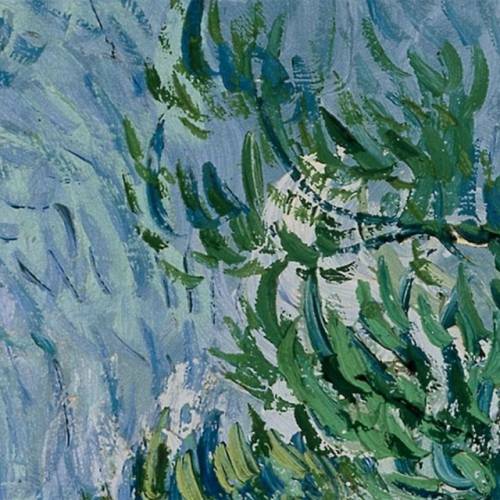 In this nature study, Van Gogh uses long brushstrokes for the tree trunks, branches and contours. For the majority of the rest of the painting – the ground, the leaves of the olive trees and the sky – he works with short, curved brushstrokes. This makes the air appear to vibrate and the heat in the olive grove almost palpable. Without painting the sun itself, here he depicts the sun’s energy and the power of nature.